Journey through the majestic scenery of the unspoilt wilderness, following the timeless spirit of the wolf-pack as they roam their lands, their freedom unchallenged. 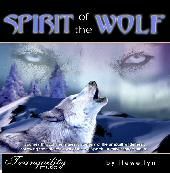 Featuring the sounds of real wolves, recorded in their natural environment, Llewellyn's inspirational composition re-awakens the joyous splendour of the wolf, and this album is indeed a tribute to his spirit. Pan-pipes, ethnic flute, percussion, rainsticks, piano, string and harp-sounds are used to great effect, while Llewellyn draws his energies from purple healing- plates, water and unique plant extracts.